Orange ​creamsicle fudge features swirls of sweet white chocolate fudge mixed with bright, fragrant, orange-flavored fudge. It's as delicious as it is beautiful and a fantastic treat to bring to any party. This is not the easiest nor the most difficult fudge recipe. It's actually what's known as a "quick" fudge because it includes marshmallow cream and doesn't require beating like old-fashioned fudge. Even if it's your first attempt at making fudge or any candy, you can pull this one off! Just be sure to follow the tips—working fast when needed and adjusting the flavor—and it will turn out perfectly. Prepare a 13- by 9-inch pan by lining it with aluminum foil and spraying the foil with nonstick cooking spray. In a large heavy saucepan, combine the butter, sugar, and heavy cream over medium heat. Continually stir the mixture until the butter melts and the sugar dissolves. Brush down the sides with a wet pastry brush. Bring the mixture to a boil, and once it starts boiling, insert a candy thermometer. Cook the candy until it reaches 240 F on the thermometer, which should take about 4 to 5 minutes. After the candy reaches 240 F, remove the pan from the heat and immediately stir in the white chocolate chips and marshmallow cream. Stir until the white chocolate has melted and the fudge is completely smooth. Working quickly from this point forward, pour about one-third of the white fudge into a bowl and set aside. To the remaining fudge, add the orange extract and orange food coloring to your desired flavor and color. Stir until it is a smooth, even color. Pour the orange fudge into the prepared pan and spread it into an even layer. Drop the white fudge over the top by the spoonful, then drag a table knife or toothpick through the fudge to create orange-white swirls. Allow the fudge to set at room temperature for 2 hours, or in the refrigerator for 1 hour. To cut, pull the fudge out of the pan using the foil as handles. Use a large sharp knife to cut the fudge into small 1-inch squares (about 35 pieces). Once your fudge is melted, it is important to perform the next steps quickly. The fudge will start to set if you take too long and the end result will not be smooth. Be sure to taste the orange fudge before pouring it into the pan. Adjust the amount of flavoring to suit your taste because the potency of different orange extracts can vary greatly. When making the swirls, you can spray your hands with nonstick cooking spray and gently press them into the top to smooth out the swirls if desired. 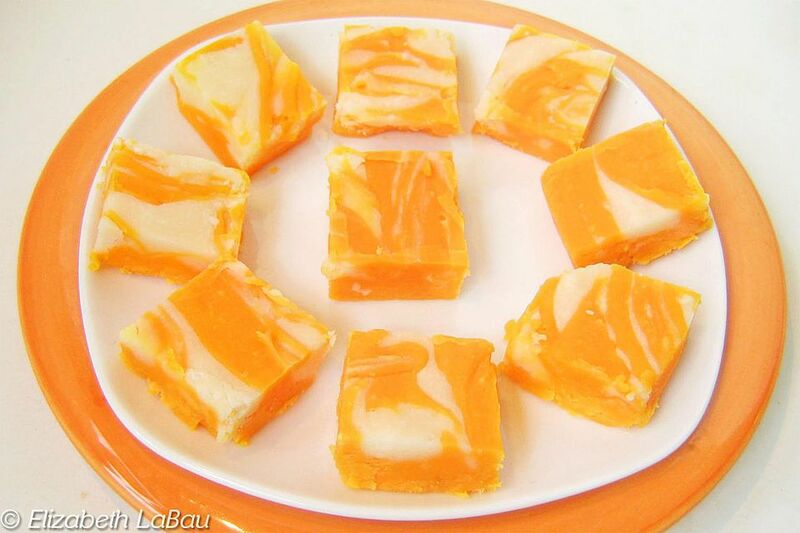 Store orange creamsicle fudge in an airtight container in the refrigerator for up to one week.